We proudly present the final track + artwork for REPROGRAM! 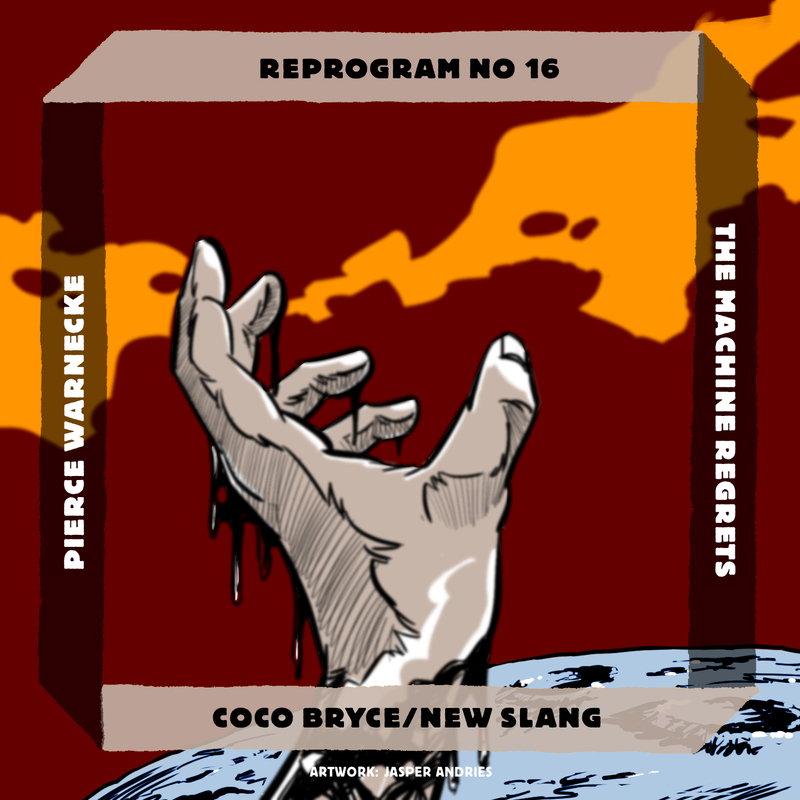 Coco Bryce remixed Pierce Warnecke and Jasper Andries provided the artwork! The Machine Regrets is the titletrack of 2012’s ‘The Machine Regrets‘ by Berlin-based Pierce Warnecke. Warnecke has been creating digital material since his studies at Berklee College of Music. He previously collaborated with artists like Kelpe, Big Mister Doom, Rodolphe Loubatière, Anton Mobin & others and performed in Europe and the US with different audio- and audiovisual projects. Once more Coco Bryce does the remixing, adding an excellent hiphopgroove and vocals by New Slang to the original. Coco Bryce is a producer/DJ, label-owner (Myor) and musical omnivore. He’s known for his productions & DJ-sets full of eclectic hiphop beats, rave, trap, skweee and wutnot. He collaborated with with artists like Kelpe, Slugabed, Pixelord and Krampfhaftand released music on Harmönia, Saturate!, Black Hole, Mässy, Astro:Dynamics, Car Crash Set & others. In 2013 he released ‘Club Tropicana‘, his second album on Fremdtunes. Jasper Andries came up with an phenomenal piece of art for this remix. Andries is an illustrator currently living in Amsterdam. The bigger part of his career he worked as a commercial storyboard artist for various advertising agencies and directors. In his spare time he focus on drawing and painting digitally doing merely portraits and caricatures over the last few years, giving it a traditional feel. DOWNLOAD THE COMPLETE ALBUM + WORKS OF ART ON BANDCAMP!